My firsthand Super-fandom has a rather decent sized hole in it. Following the Reign of the Supermen, I kind of fell off the franchise. I popped back in from time to time for the more sweeping DC crossovers, like Zero Hour and The Final Night... but never hung around long enough to build any sort of longer narrative run. It was during this era that I found myself consistently coming back. Ed McGuinness' art was like a beacon among the already colorful late turn of the century comics output that attracted my attention. Grabbing issues of this vintage changed my perception of what Superman comics could be. Jeph Loeb 's writing was excellent and Ed McGuinness' pencils were amazing. Characters were larger than life... literally. It was under Ed's stylized pencils that Superman was given something of an exaggerated physique. He was massive, just as he should be. Superman should always be the most amazing being on any page he is featured on. Loeb and McGuinness brought me back to Superman where I remained with the titles until around Infinite Crisis. This issue was the first of my run. We join the story during a post Y2K press conference. Lex Luthor is raising Superman's arm in the air in celebration... Superman looks as happy by this photo-op as one would imagine. The Y2K fallout turned Metropolis into the true "City of Tomorrow", and Luthor has wormed himself into the proceedings as a focal point and into a de facto leadership position. Luthor had recently "rescued" Gotham City during the No-Man's-Land mega-arc, and now claiming Metropolis among his victories may have his sights set to the highest office in the land. Irritated by the proceedings, Superman is Smallville-bound in attempt to clear his head. Perhaps feeling as though some fresh farm air and a heaping helping of biscuits and gravy will break him out of his funk. Clark is none to pleased to discover his is not the only "S" looking for some down time on the Kent farm. We walks in on Kon-El Superboy sharing his heroic exploits with Ma and Pa. Much to Clark's irritation, this is during a time in which Superboy is drawing conclusions in regard to the connection between Superman and Clark Kent. The exchange between Clark and Kon is contentious to say the least. Clark views Superboy as something of an interloper... invading his "safe" place. He is disappointed to find out that Kon is actually an invited guest of the Kents (they had met during an issue of Superboy). Clark walks out to the porch to stew. There is a Lois subplot where she is attempting to get some time off from the Planet. Perry is not having it, and questions whether Lois and Clark may be having some troubles at home. Clark was officially an International Correspondent during this time, and Perry felt as though the "time apart" was too much of a strain on the Kent marriage. Lois storms out, not noticing when she bumps into Jimmy, almost knocking him over. This scene features a Daily Planet hallway that I always enjoy seeing... it is the hallway with blown up front covers of the Planet that make mention of events that we have read. During this scene, we see the reference to The Final Night, Funeral for a Friend and The Reign of the Supermen. I loved seeing this hallway return when Geoff Johns and John Romita Jr. came on to Superman (vol.3) #32 a little while back. It brings history and cohesion to the DC Universe, which I really dig. Back in Smallville, Ma Kent joins Clark on the porch. Clark is confused and frustrated about recent events, including his current relationship with Lois. In a recent issue of Action Comics, Clark and Wonder Woman were trapped in another dimension in which they lived for a millennium. Clark claims that "nothing happened" however cannot shake his feelings of guilt. In a touching bit, Ma says having Kon around reminds her of Clark being that age. Clark returns to his bedroom, only to find Kon looking at some of his belongings. It appears as though Kon is really trying to get to know Clark, learning about his past, associating with his family. His attempts are somewhat coldly dismissed by Clark. The next morning, Clark joins Pa out in the barn to milk the cows. Pa and Clark have a talk about whether or not Clark should trust this Superboy. Ultimately, Clark decides to try and be a bit more friendly to Kon, even teaching him how to milk a cow. Later on, it is time for Kon to leave. The Kents (Clark included) tell him he is always welcome to return. 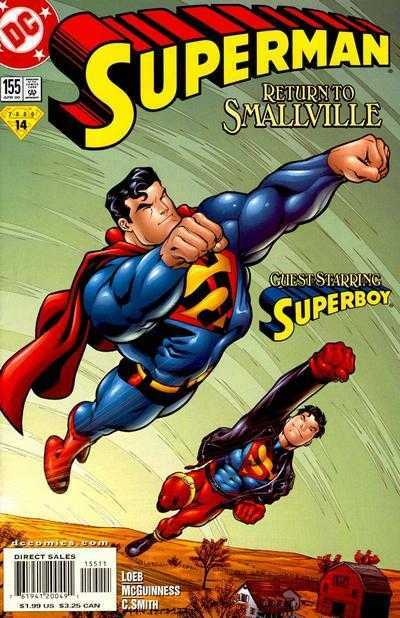 While Superboy is flying away, he is caught up to by Superman. In a short back-and-forth, Superman rephrases something he's told Kon as Clark. I take this as him letting Superboy in on the secret. The two decide to race back to Metropolis. As this issue draws to a close we observe Clark ringing at his apartment with a bouquet of flowers for his wife. To his surprise, Lois answers the door in a revealing dress. She tells Clark she has plans for the evening, and advises him not to "wait up". Clark is left in darkness, flowers in hand. Even sixteen (16???) years later, this is still a fun and satisfying read. I will always have a soft spot for this version of Superboy, and always enjoy Clark being portrayed as a son. The Kents listening to Clark's worries, and offering him advice is one of those things that is sorely missing from the New-52 version of the character. I love that Clark has a getaway... a place he can decompress and be with family. The family aspect is so undervalued today, yet I still feel as though it is vital to Clark and Superman's character. The writing and art are top-notch throughout. Clark is depicted both through dialog and appearance as vulnerable and quite human. The coloring is beautiful, very vivid. I have a special fondness for the paper stock used during this vintage. It is somewhere between newsprint and glossy. While newsprint can make art look ugly, and glossy paper attracts glare and smudges... this paper stock does neither. Both Marvel and DC used this paper during this time, and I loved it... I would honestly trade today's glossier paper for this. The only visual complaint I have is with, of all things, the lettering. There is a certain shakiness to the lettering that sometimes distracts while reading. This is an in between issue, placed between the Y2K arc and I believe an upcoming Parasite arc, which will focus on Lois' abrupt shift in temperament. This issue has been collected in Superman: 'Til Death Do Us Part, (Michael Bailey at the Fortress of Baileytude does a fantastic breakdown of this collected edition) however, does not appear to be available digitally. You could do far worse than to track this one down. Psycomic... absorbed by View Askew in 2001.